Click here to RSVP for the Facebook event. Full details below. Seen&Heard is the collaborative effort of photographer Mikhaila Jurkiewicz and designer Erin O'Brien. It is a collaborative project, inspired by people. First and foremost it is a series of photographs which focuses on women, trans, non-binary and gender diverse people who are doing interesting, exciting, and creative things in Australia. It shines a light on the creative practices of people working in music, writing, visual art, and those who work in support of women and gender diverse people in these fields and aims to put a focus on the adversities they have faced and how they seek to empower themselves in male dominated spaces. 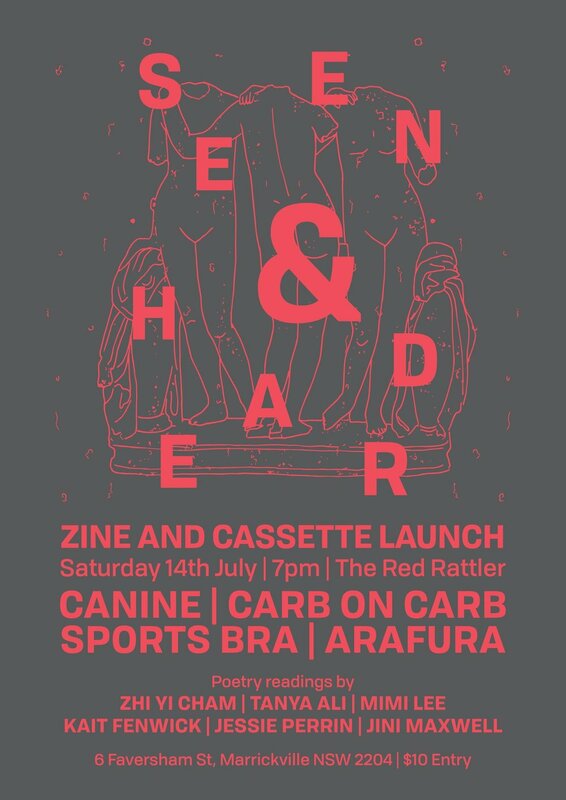 This show, organised in collaboration with Subbed In, is to celebrate the launch of the first Seen&Heard zine and cassette, and features performances from people included in both. An exhibition of the photographs will follow with details TBA. Zhi is a Malaysian poet on Ngunnawal country, now existing as the esoteric wormhole known as Canberra. She loves cooking, nourishing & drive thru's. Zhi also enjoys obsessively changing her bio on Instagram and being mediocre & joyous as McNuggets. Read a couple of poems by Zhi over at Ibis House. Tanya Ali is a first-generation Pakistani writer and musician from Sydney who dabbles in doodling. She is the host of Monday Arvos and co-hosts Agenda on FBi Radio, and is also Peril magazine’s Music Editor. Along with music, her interests lie in culture, race, politics and art. Mimi Lee is an emerging writer who was born in Sydney, but spent the majority of her childhood in Shanghai, China. Her short story will appear in the Own Voices anthology Meet Me at the Intersection in September this year. Other than writing stories on themes that are close to her heart, she enjoys reading, singing, bushwalking and watching movie. Mimi is currently praying that her novel manuscript will be published. Kait Fenwick is a queer poet living in Newcastle, Australia. In 2017, they completed their Honours thesis titled ‘Digital Queeries’, a series of poems that explored the relationship between millennial queers and the internet. Their work has been published in the Contemporary Australian Feminist Poetry anthology, Butch Is Not a Dirty Word magazine, Archer and Cordite Poetry Review. They begin a Master of Arts (Writing) at Swinburne University of Technology in August. Jessie Perrin is a writer and teacher currently based in Sydney. Her work has appeared in publications including Ibis House, Voiceworks, Scum Magazine, Lor Journal and Underground Writers and has also been heard on FBi Radio's All The Best. Read a short story by Jessie over at Ibis House. The rat is super easy to get to on a bike and there are several areas on the street suitable for chaining up your wheels. We ask that you don’t leave bikes overnight, as the street is a busy industrial zone during the day and the bikes get in the way of our neighbours’ businesses. The Red Rattler Theatre is a 5 minute walk from Sydenham Railway Station. For timetable information, visit Sydney Trains or Transport NSW. There is very limited on-street parking, and we encourage our patrons to use public transport, taxi or cycle. We acknowledge that this show takes places on the stolen land of the Gadigal people of the Eora nation. We pay our respects to elders past, present and emerging and acknowledge that this always was, and always will be aboriginal land. We intend for this event to be safe and inclusive - a space free from sexism, racism, homophobia, transphobia, ableism, or discriminatory behaviour of any nature. The organisers reserve the right to refuse you entry or ask you to leave if you exhibit this behaviour.